You have your choice when it comes to entertainment options with Carolina Fun Factory. Looking for a venue to host your child's birthday party, or a family reunion, or even a company picnic? Our beautiful 22-acre farm, conveniently located in Carthage, NC...a sleepy little bedroom town in the heart of Moore County, NC... is your answer! Our farm features a fully enclosed Party Barn available for private rental, an extensive petting zoo, and many entertainment options that you can select for your event. Would you prefer to host your event offsite? Then sit back and relax, because we'll bring the fun to you! We deliver an array of unique, and in some cases, one-of-their-kind event activities, including inflatable bounces, and interactive obstacle courses, carnival games, an authentic trackless train, animal exhibits, rock climbing wall and SO much more. Regardless of whether you visit us on the farm, or if we come to you, we guarantee to provide a fun, SAFE, and memorable experience. Very often children want a chance to ride a pony outside of a Pony Party or festival setting. But where to go? Carolina Fun Factory welcomes visitors who just want to ride a pony for no other reason than it's FUN! Great outdoor opportunity! If you have been looking for a place to have a birthday party near me then you have found the best venue for a kids party in the Moore County area. Everyone loves the Party Barn and the spacious location here at the farm for a toddler birthday party place all the way up to a place to have a party for older children. We offer family fun for everyone here at our Carolina Fun Factory farm venue. What better way to compliment your farm animal unit of study than to bring your students out to the farm to see up close and personal the animals that you've taught them about. Our programs offer a unique hands-on opportunity to explore. Family's just like yours enjoy our annual events here on the farm. 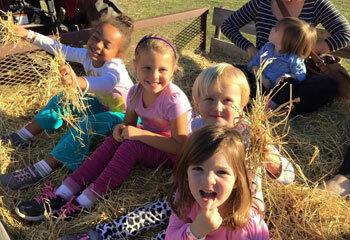 Annually, we have good ol' down-on-the-farm fun which includes hay rides, pony rides, train rides, pumpkins, hay mazes, Santa Claus visits and MORE! Visit this page updates.